EyePrintPro in Owings Mills, MD. Imagine a scleral lens that's designed & molded to your eye to help with eye conditions including keratoconus, astigmatism, and dry eye. EyePrintPro provides treatment for those with severe corneal irregularity. EyePrintPRO™ was designed for patients with severe corneal irregularity. The EyePrintPRO™ is a prosthetic scleral cover, used to improve vision by creating a smooth new surface for the eye. This new surface aids in improving vision in those with irregular corneas, as the scleral shell allows light to properly reflect into the eye. Each EyePrintPRO™ is unique to each patient, much like a fingerprint. How is EyePrintPRO™ different from scleral lenses? The process begins with a consultation from your eye doctor to ensure that EyePrintPRO™ is the right solution for you. Once your doctor has determined that you are a good fit for EyePrintPRO™, the fitting process will begin. The EyePrint Impression Process only takes minutes and can be done in office. This procedure is gentle, and extremely accurate. Once your precise fit has been determined, your EyePrint Impression information is shipped to EyePrint Prosthetics LLC for digitizing and prosthetic scleral cover shell design. Using advanced 3D scanning and computer technology, an exact match is created to fit your unique cornea and sclera. The EyePrintPRO™ is similar to a scleral lens in many ways, but it does differ in other ways. The biggest difference is in the design process. While the scleral lens is fitted to your eye through a trial and error process, the EyePrintPRO™ is designed from actual measurements from your individual eye. EyePrintPRO™ is created by taking an impression of the eye, the same way a prosthetic eye is created. This results in a highly individualized, more comfortable fit for our patients. Would someone fly in for an EyePrintPro fitting? Yes! This contact lens solution is that advanced and customized that results are practically guaranteed. There's nothing like in the world. EyePrintPro is only offered by a select number of eye care professionals, and even fewer eye doctors who are Diplomats of Corneas like Dr. Schwartz. Our office is conveniently across the street from two hotels, so patients seeking EyePrintPro lenses can have a place to stay close to our practice. How does EyePrintPro differ from other specialty contacts? Night and Day. These lenses are molded to pinpoint the actual curvature of your eye for maximum detail. 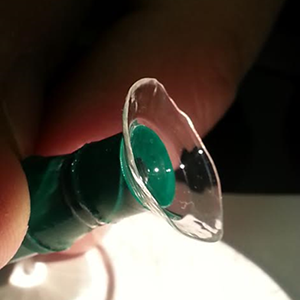 Scleral lenses vault over the cornea so the calculations are far less sophisticated. Although scleral lenses are customized per individual and are costly, EyePrintPro is simply on another level of design that addresses even the most severe of corneal irregularities. Why is EyePrintPro only offered at your practice? EyePrintPro chose Eyesymmetry Vision Center as one of the few centers to fit EyePrintPro lenses, but Dr. Moshe Schwartz OD FAAO has led the industry in specialty contact lenses by inventing techniques to treat severe corneal irregularities, achieve ideal fits with the least number of trial lenses, and built absolute trust from each of his patients through his devoted, compassionate, and attentive care. Why is EyePrintPro™ different than other specialty lenses? Not all contact lenses are created equally. EyePrintPro is used by certified practitioners to treat eye conditions like keratoconus and other cornea irregularities.